Lorenzo Gonzalez (B.S. ’79) served three tours during the Vietnam War, but his days of fighting are far from over. 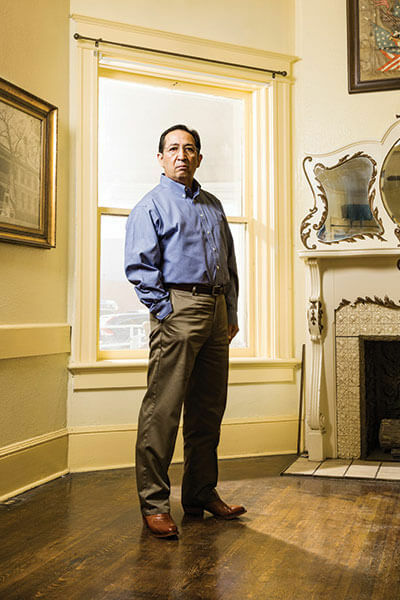 As a co-founder of the nonprofit organization United States Military Veterans with Parkinson’s (USMVP), Gonzalez is lobbying for research and support for veterans with service-connected Parkinson’s disease and other neurological disorders. Gonzalez, too, has the disease. The diagnosis came in 2005. Suddenly the mysterious symptoms that had been plaguing him — the lag in his gait and the slurring of his speech — made sense. What didn’t make sense was how a longtime health and fitness enthusiast like Gonzalez could have, at the relatively young age of 57, an illness often associated with the elderly. Agent Orange, an herbicide that contains the highly toxic chemical dioxin, was used by the U.S. military to clear acres of foliage in hopes of depriving opponents of cover. Named because of the orange stripe painted on the 55-gallon drums in which it was stored, Agent Orange is believed to be the source of devastating health effects in an untold number of veterans and Vietnamese nationals. Gonzalez was involved in the U.S. Navy’s efforts to transport ammunition through Vietnam’s Mekong Delta between 1969 and 1971. At the time, he thought little of working in the extensive stretches of jungle that had been killed off by the potent herbicide. Though an exact cause of Parkinson’s has never been determined, Gonzalez couldn’t shake the hunch that it might somehow be connected to Agent Orange and other wartime chemicals. Gonzalez poured through scientific articles that analyzed chemical toxicity and Parkinson’s. Amazed at the amount of research that had been done in the public sector and appalled at the lack of follow-up investigation by the government, he began an investigation of his own. He started with a list of 250 veterans with Parkinson’s and began interviewing them about various chemicals they could have been exposed to while in the services. A few of them who shared Gonzalez’s suspicions about Agent Orange joined his cause. Together they began contacting congressmen, demanding funding for more research on the correlation between dioxin and neurological disorders. Their efforts led to the formation of USMVP in 2008. But even when they did find legislative support, money always seemed to be an underlying issue. By 2008, the debate on Agent Orange-related illnesses was as hot-button an issue as ever. The Institute of Medicine (IOM) had caught wind of Gonzalez’s push for more research on the toxin’s relation to Parkinson’s and, in March of that year, asked him and his colleagues for a presentation of their findings during a meeting in San Antonio. Gonzalez’s team contended that enough data existed to support a connection between dioxin exposure and early-onset Parkinson’s, adding that affected veterans should be eligible for benefits from the Department of Veterans Affairs (VA). The IOM agreed. In a pivotal 2009 ruling, the VA, following a recommendation from the IOM, officially added Parkinson’s to the Agent Orange presumptive list of service-connected diseases. the effects USMVP’s work is having on others’ lives. He once received an impassioned phone call from the wife of a veteran, thanking USMVP. Her husband, a farmer, was suffering from Parkinson’s and no longer able to work. Without the VA’s ruling and the benefits they subsequently received, they would have had to sell their land to cover medical expenses. Now 66, Gonzalez had imagined he would be enjoying his retirement with his family. But he is devoted full time to the USMVP, which has grown to more than 300 members. He continues to assist ill veterans and pursue funding for new research. Gonzalez is also adjusting to his own life with Parkinson’s. He has good days where he can carry on relatively normally and bad days where the symptoms are nearly debilitating. But he refuses to be defeated by his illness.